From all my travels I notice one thing about what you would call the real Dub…they ‘get’ the humanity of Jesus and they relate to that humanity deeply. They find in the human Jesus a fellow pilgrim who inspires, understands and supports. There is a mutual empathy that sees one through crisis after crisis whether that crisis is in the church, the state, in family, in friend or in self. Every so often and more to the point, when necessary, that humanity of Jesus falls aside and the divine aspect of Jesus’ nature is glimpsed. This divine is not something remote and aloof from our real needs and concerns but it lies in a moment when things make sense, the realisation that there is a plan and there is a life that is considerably richer and more worthwhile than that which the daily drudge deals out. In this moment there is great consolation and strength. If the truth be told these insights don’t spare you any relief from the tough hand that can often be dealt to you but it does give you a way of playing that hand better. This common sense approach to life can be seen in the images that Jesus uses in this evening’s Gospel. They are all images that are accessible; images that an industrial farmer or a humble gardener on Tonelgee Road can perceive and see beyond. This ability to see beyond and to be informed by what is beyond the ordinary is there for all to engage without price. Some choose not to, some through no fault of their own are unable, some choose to say nothing but just live out of what they find there, and others do it in such an exceptional way that they are called poets. And catch the heart off guard and blow it open . Today is the Eleventh Sunday in Ordinary Time. After the multiple feasts of Easter, Pentecost, Ascension, Corpus Christi, we are asked to settle down and find the joy of the ordinary. In a sense the liturgy shifts to where we are most comfortable…especially for ‘the Dub’. We hopefully move from a heightened sense of the divine to more a comfortable contemplation of humanity; our humanity and that of Jesus. Those who have moved on from life with the church miss these well-crafted reminders of life and well-being. If there is any theme for Bill’s 90th birthday it is simply ‘the ordinary’. If you want to live till ninety without getting yourself up to ninety well leave the bling aside and in the words of Saint Thérèse of Lisieux ‘do the ordinary things extraordinarily well’. Simply put, in doing the ordinary things well the extraordinary makes itself know. One informs the other making life deeply worthwhile. I think what is being said this evening and what we need to hear is that a long life can have its own pressures and crosses but it doesn’t have to be unbearable. Through grace and good fortune, (especially with regard to our health) life can be immensely interesting and full of fun. As with any age one has to draw on ones God given resources of physical health, mental attitude, spiritual depth and create a dance between emotional detachment and engagement to celebrate the ordinary. That is why I think this 90th is being marked at the ‘ordinary mass’, where the ‘ordinary’ chores are carried out (taking up the collection), and an ‘ordinary’ cup of tea is being served afterwards in the parish hall. It is another day but any day in which there is nothing to celebrate is a sad day; and if we are to learn anything this evening it is that every ‘ordinary’ day in ‘ordinary’ time has something to celebrate. Whatever views and opinions abound about life and its values I know that there is an underlying belief in ‘the dub’ who gets to ninety that you are morally bound to serve those who may be of a similar age but may not enjoy the same sense of well-being. The greatest fear at this age is not one of health alone but that you fall prey to a growing trend in our world today, a trend which is a prison of sorts. That prison one has to aim to protect oneself from is that of disappearing into a prison of narcissism, of self-doubt, of self-loathing, of self-pity or just plain ‘self’. It was the Ballylongford poet Brendan Kennelly who wrote ‘self knows that self is not enough’. To conclude. Living the ordinary life is not something passive as I said earlier. One of my favourite contemporary writers is Colum McCann and in one of his books he said ‘it takes great courage to live an ordinary life’ and so it does…but there are many fine examples of that courage…we don’t have to look to far. May the big soft buffetings of the ‘ordinary’ that Seamus Heaney talks about catch our hearts off-guard and blow them open so we can find our dignity, our depth and our strength as we aspire to follow that example of Saint Thérèse of Lisieux do the ‘ordinary things extraordinarily well’. Migrants and Refugees: a problem to be solved? People move because they either want to or they have to. Whether people are getting out of bed; going to the shops or traversing borders; they are doing so because they either want to and or they have to. In the world of migration, there are those who have to travel. At Christmas we reflect on the life of those who have go to another city to get their paper work in order. We see them set off on a donkey and they travel to a town called Bethlehem. On another occasion in their life they want to make a future for their young child so they set up home in a town called Nazareth and there they watch their child grow in wisdom, age, and stature. All around us as we left Dun Laoghaire, there was drunkenness. The younger men were drunk – not violently so but tragically so, as I was, to forget the dreadful loneliness of having to leave home. Underneath it all was the heartbreaking frightful anguish of separation. It would be a waste of time for me to launch into a description of what went on. A person has to be part of it to feel it. He, and others like him, were forced to travel because there was nothing for them in their home place; they could no longer be who God intended them to be; they had to go. The luxury we call choice was not theirs. John B. was in his early twenties. Today, many his age and younger, make hazardous journeys across the globe; not because they want to but because they have to. Some commentators dip into bitter taste of emigration into sugar. Their narrative is coated in the language of opportunity and adventure as they attempt to make their stories digestible; distracting from the many hearts that are broken. We were 55 Somalis in an inflatable boat. They just gave us a compass and a GPS and told us which direction to go …around 160 km from Tripoli, the boat started taking on water…but no one came to rescue us…some women were pregnant and vomiting. Ahmed had to leave the place he called home. Given the choice he would not have left, but conflict drove him away. As he said quite poignantly ‘I never dreamed I would end up in the sea’. Let us be in no doubt that this is the world we have created. Some applaud the global economic advances of the last decades. However, there is a downside to our increasingly globalised world. The upside of this world benefits the few; the downside is experienced by the many. The desire for Empire and power by the Romans at the time of Jesus created a downside for a humble couple about to give birth to their first child; similarly our globalising world, which is crazy for power and control, is leaving many people struggling on the downside of life. There are privileged people, who, from their desk in London, Dublin, Hong Kong or New York, can, at the click of a mouse, pursue streams of money. There are others who work in squalid conditions, often illegal or undocumented, who pay a commission when they send a few euros home at the end of their working week. If those who clicked the mouse on the vast amounts of money that traverse the world paid they same taxes and levies on their transactions as those who send their hard earned money home to their families; the revenue stream from these taxes would go a long way towards alleviating poverty and debt. In summary, Pope Francis tells us in his Message for the World Day of Migrants and Refugees (2014 ) that ‘the reality of migration…points to the tension between the beauty of creation…and the mystery of sin’. We must now follow the Holy Father’s invitation to see the migrant as a prophetic voice of our time. He continues; ‘they (the migrant) are an occasion that Providence gives us to help build a more just society, a more perfect democracy, a more united country, a more fraternal world and a more open and evangelical Christian community’. These are challenging words for us. These challenges may become more acute when Pope Francis tells us that ‘migrants and refugees do not only represent a problem to be solved, but are brothers and sisters to be welcomed, respected and loved’, However difficult these words appear, they take on a vastly different context and significance when we apply them to the young couple with child travelling to Bethlehem a little over two thousand years ago. A knock came to the door late at night. ‘Who is there?’ asked one of the sisters? ‘Jeanne’, came the reply. There was a sense of shock and confusion because Jeanne was killed only yesterday along with five other girls. The soldiers came and they let the militia beat the girls to death with rocks. This happened on May the 18th 1994 a month after the genocide had started. The remains were placed in a shallow grave the day after they were killed. The sister who opened the door thought she was dreaming; Jeanne was dead as far as everyone was concerned. What’s more she had been buried. Obviously the wounds had left her heavily concussed. Her hair was matted with clay and she collapsed as soon as she entered the room. More than likely she was buried on top of the others. Maybe the rain had washed away the soil or maybe the convent dog who had been behaving mysteriously had scrapped away at the soil freeing Jeanne from the weight of inevitable death. Her head was gashed and her left arm was badly damaged from the beatings. She couldn’t be brought to the hospital because every day the soldiers and the militia visited to the hospital to ‘finish off’ those who were still alive. The sisters brought Jeanne to a safe place. They cleaned her wounds with sterilised water, which was all they had available to them. Jeanne and the sisters meet every year on the anniversary of the day she climbed or crawled from the grave. She leads the prayer and her invocation every year and indeed every day of her life is ‘Wherever you go, you are with God’. She now teaches in a University in Rwanda. 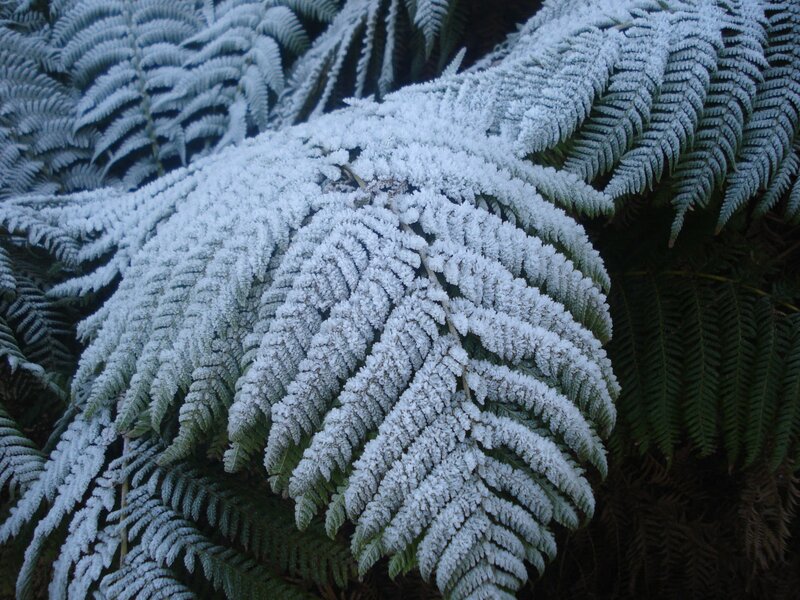 Survival is not about coping it is about living life to the full. When life is taken away from you; when you see nothing only darkness, then your basic humanity and whatever divine spark you have within you turns you to the light. In the western world we juggle dualisms; darkness and light, life and death, good and evil. When you find yourself in the heart of darkness, in the jaws of death and in the cradle of evil you are left with only one option. Jeanne and many others like her live with that option. They now live in light, life and goodness. As one of the sisters said, surviving the genocide leaves us with a duty to place goodness on the throne for all to see. Fr. Jerome is a big man as you can see from the photo. When the genocide started in earnest word was out that he was to be killed. The local soldiers decided to let the older priest in the parish live thinking that they would need him to get aid from NGOs when they were reconstructing the country. Jerome was first hidden in the roof of the priest’s house on April 30 with the aid of some of the soldiers who were parishioners. He heard overheard a lot of the killings from his hiding place. Four hundred and seventy six people were killed in the church; among those were two hundred and two children. He was two weeks hiding when the ceiling collapsed from under him. He landed on the kitchen table to the shock of the man who did the cooking in the house. This man was a Hutu. This placed the cook in a awkward position. If he decided not to tell, he would be seen as a collaborator. Jerome saw no difference between the Tutsi and Hutu despite government policy. Like many others in the parish he was praying for Fr. Jerome as the other priest had passed word around that he had been killed. From the perspective of the cook; falling from the celling was akin to Jesus rising from the tomb! With the cooperation of the cook and others he remained in hiding in a press in the church until July 3. After the genocide he went to Belgium for six weeks to rest and recover from his ordeal. When he returned he took on a neighbouring parish as well as his own. The priest in that parish had been a victim from genocide; the people had no one to minister to them. Unlike his own parish; this Church has been used by the soldier sand the militia to murder people. The sanctuary area was splattered with blood; the people could not bring themselves to step into the Church for services. All that remained were widows; widows of Tutsis who had been killed and widows of Hutus who were in prison or who had fled. The houses were ransacked and levelled; the widows were living in a pig sty with their children, about ninety in all. They lived with the pigs and the rabbits; when it rained they got wet. The Tutsi women were stoning the Hutu women when the set out to visit their husbands and children in prison. It was understandable; these people still had their husbands; the Tutsi women had no one. This was the situation that Fr. Jerome inherited. Sr. T had also recently come back to the village. On her first day back she was immersed into the tragedy of it all. The women were lifting the bodies of their families from the latrines (a trench that served as a toilet). She transported sixty bodies in her car to the place of burial. There was no protection from the reality of the devastation; no place to hide; no place to be alone with your thoughts. When Sr. T. and Fr. Jerome got together they realised a lot of work had to be done. The work was physical, emotional and deeply, deeply spiritual. 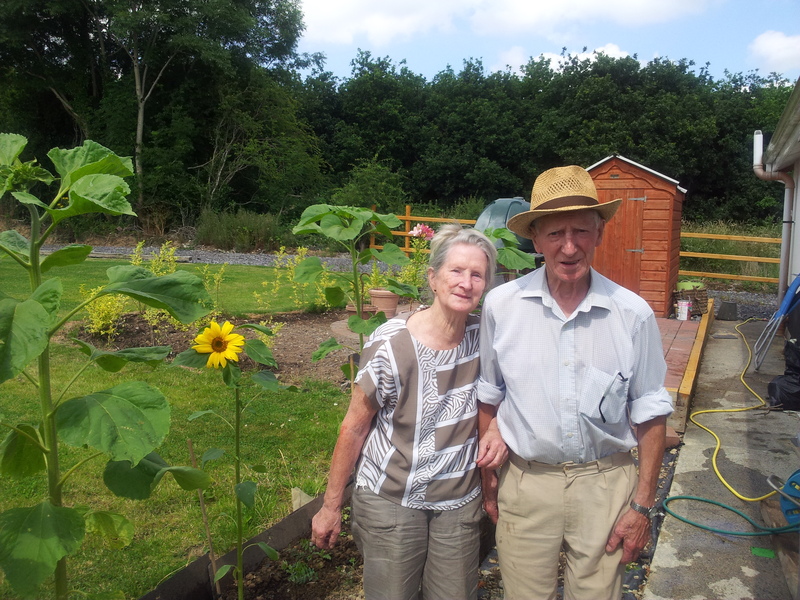 They contacted John Bosco and Christine and together they set about starting a house building program. This was part of today’s celebration; a community saying ‘thank you for taking us out of the pig sty’. This young lady was five when the genocide happened; she remembers living with all the other people and she also remembers moving to her new home with her mother and eight brothers and sisters. She now attends college in Kigali. Building the houses was the easy bit; building lives was more difficult. How do you live together again when your neighbour mother your husband and children. Jerome and Sr. T noticed the tension and animosity. They encouraged the people to sit together and listen to one another. Eventually and after much persuasion they sat down. The tragedy was so deeply ingrained that few could hear the pain of the other. Stories were heard and hearts were healed; stones were no longer being thrown. Those who had lost loved ones to the genocide were heard and those who had other narratives were heard as well, ‘I am saddened that my son became a killer’ is one instance of this. Sr. T used scripture to help the widows grow in understanding. 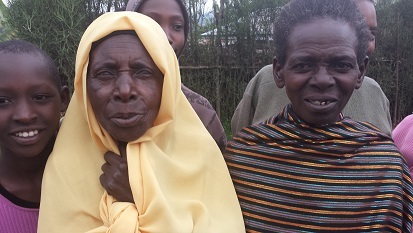 One widow, so fascinated by the stories asked, ‘were these stories written before or after the genocide!’ The group grew from five people to nine hundred and sixty four people. The people who spoke today built on these groups and the ladies who addressed us set up a group called ‘The Courage to Life’. There is much more to day but the bus leaves soon. Fill you in over a coffee. 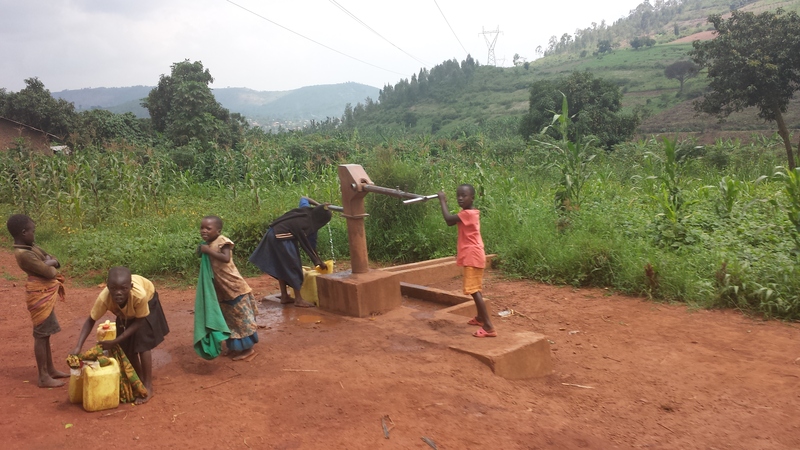 Day Five; Rwanda…The Pen Man Cometh. While others stepped off the bus to visit a home care project attached to Partners in Health I waited behind. 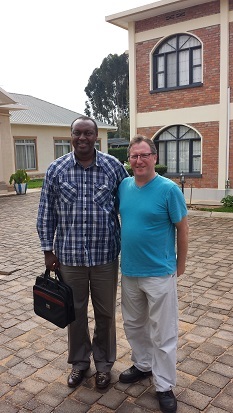 I wanted to spend some time talking with Sr. T who has worked closely with Tutsi and Hutu survivors of the era of genocide in Rwanda. She says she needed to because she is a survivor herself. 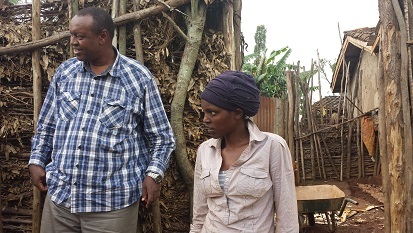 She is a true example of mission which is not primarily aid according to the Rwandan theologian Emmanuel Katongole; ‘mission is to engage in friendships that lead to the formation of a new people in the world’. The bus attracted the interest of some of the local people, especially the children. Before I left Ireland I bought a lot of pens or ‘biros’ as they are called. We started a little game with the children. With the help of sister and the driver we asked the children to show us if they could write. Immediately they started writing in the soil. 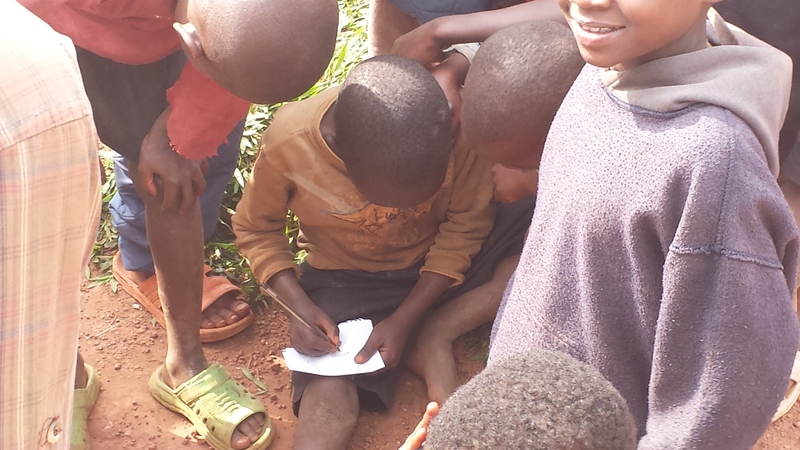 We gave one of the children as sheet of paper and a pen and asked him to write. The others watched as he carefully wrote his name. When he handed it to the driver, the driver said ‘keep the pen’. His eyes lit up and then one by one they tried to show off their talents on the same piece of paper. Sister explained that literacy really reveals their level of poverty; those who cannot write are most likely from very poor families. One girl, unable to write her name, wrote the numbers one to five and showed their fine work with great delight. The photos show the way they encouraged one another. They spoke only Kinyarwanda which is the native language of Rwanda but they all said a big ‘thank you’ in English. A simple gift of a biro brought so much pleasure and all were happy to share the one piece of paper. Before we left we gave a pen to each child. The visit to the hospital was extraordinary. Without putting a tooth in it; how many oncologists are there for the eleven million people in Rwanda? You could try to guess but you’d never get it. There is one, yes one! In a country that has seen a lot of people affected by the trauma of genocide and yet there are six psychiatrists in the county and they are based in Kigali. The country has three CT scanners and one MRI machine. There is one school of medicine producing eighty doctors a year but most leave Rwanda, seeking work abroad. In summary there is one doctor for every seventeen thousand people. A lot of good work had been carried out over the years and results are being achieved. Ten years ago no one was being treated or HIV now the hospitals have ten thousand people on their registers. Many women contacted HIV when they were raped during the genocide. Partners in Health has trained volunteers from local villages. The people have to be first elected by their follow villagers; they must be able to read and write and be numerate. The volunteers are trained by the hospital aiming towards an average of three health workers per population of two thousand people. Their interventions treat young and old for simple things like malaria, diarrhoea, nutrition, clean water, bed nets to cut down on malaria and TB. They also provide assistance to expectant mothers. These matters may be ‘simple’ to us in the west but they are a matter of life and death for villagers. The new hospital building under construction in Kayonza..a big improvement on the old buildings. Now back to the bus. Sister T. is a survivor of the genocide. The charism of her order is to live among the poor. We spoke for a long time about how healing happens among the people. It was an extraordinary conversation as she described working with Hutu and Tutsi widows. The range of emotions and stages that were traversed are extraordinary. Tomorrow we meet with this group and hopefully we will hear how their experiences can help others on the path towards healing; at least for those who feel they want to heal. Many were killed in the village where Sr. worked. She and her community fled to safety just in time. Work came out that priests and nuns were to be targeted as part of the genocide in early July 1994; acting on this information many made it to areas protected by the RPF. There is no text book for people who survived the genocide. The only resource lies among the people who not only survived but chose the path of reconciliation. This path was chosen not because one party was reaching out to the other but because some people felt they could not live without making peace in their own hearts. I look forward to meeting with them tomorrow. 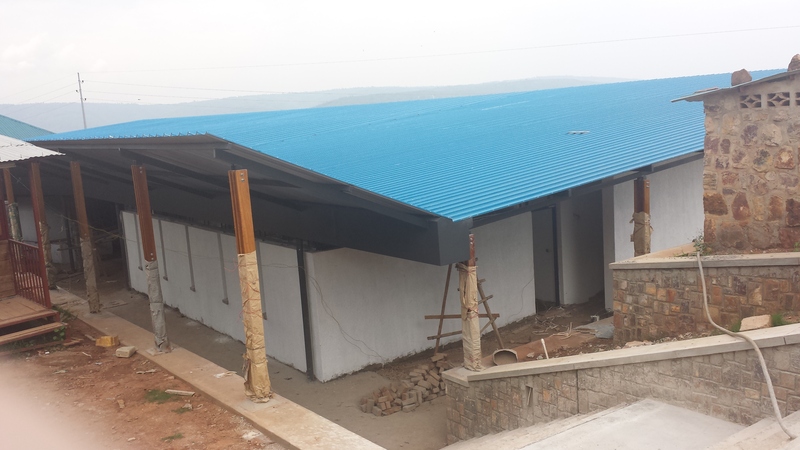 On the outskirts of Kigali there is a Technical College which provides technical and vocational education to many young Rwandan adults. This school was formerly known as the John Bosco School. On the 11th of April 1994 three thousand people who took refuge in the school were massacred. People made their way to the school to seek protection. The UN peace keeping force kept guard at the gates of the college from the outset of the genocide giving those inside a place of certain refuge from the surrounding slaughter. The militia had surrounded the area but the UN presence kept harm at bay. On that fateful day, the 11th of April, the UN guard reported that they were standing down; according to the officer in command they were recalled. They left the school and headed straight to the airport. Someone somewhere decided that the UN no longer had a role to play and people were left to the mercy of the madness. The Commander of the forces, General Dallaire, was convinced that a team of five thousand troops would keep order on the streets. The cable he sent to the UN was ignored. He had reported to those in command that ‘something big’ was about happen. He knew of the distribution of arms and was told that the militia had been trained to kill one thousand people in twenty minutes flat. 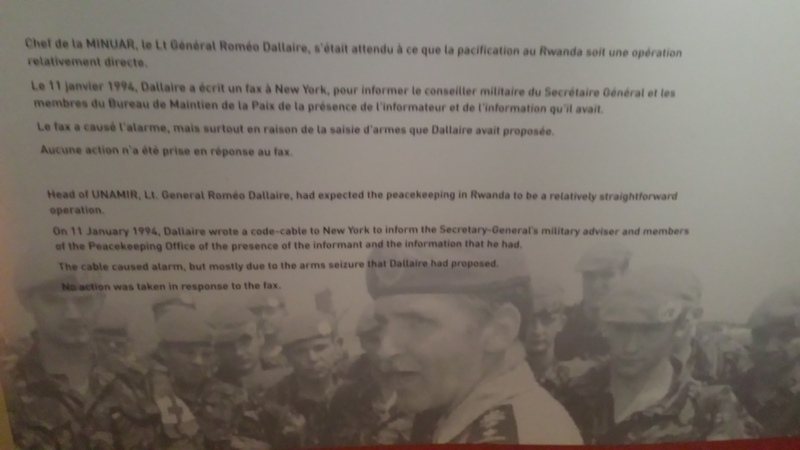 Obviously vested interests won out and Dallaire’s efforts were all in vein. The Rwandan people were never important in this outbreak. There is evidence to show that French soldiers trained the militia and other information reveals that President Mitterrand’s son was an arms dealer. When the genocide had come to an end President Mitterrand was reported to have said by the newspaper Le Figaro that ‘In such countries genocide is not too important’. Many of the people in the John Bosco school lay down in front on the UN trucks pleading with them to stay but the UN soldiers fired into the air and made their way straight to the airport. Then the slaughter began. People had been in the compound for four days at this stage; most were hungry and tired. For some strange reason the army commander put out the order that the people were not to be killed on the site. They were to be ‘rounded up’ those who worked for international offices and those who had Hutu identity cards were put to one side; the rest were ordered to march up a hill to a new location. Any that stumbled were shot or clubbed to death. Military jeeps kept the three thousand people together as they made their way to a new location. Today I met one who survived this tragedy. Out of the three thousand there were only one hundred survivors and of those one hundred only twenty did not suffer a permanent disability. The soldiers started by throwing grenades into the crowd and then opened up with ammunition. When they had run out of ammunition they invited the militia to make sure everyone was dead; they did so with the aid of clubs, spears and machetes. (Interestingly the guide at the museum earlier today told us that the government have just only recently finished paying off the bill for the machetes to China close on twenty years later). The lady that spoke to us today told of a militia man standing on her chest and searching her pockets while she pretended to be dead. At another stage a militia man hit her on the head with a hammer three times again she feigned death. She heard her husband calling from the heap of bodies but could not move from the spot where she lay. She listened as babies cried and listened still as those babies cries died away during the long night that followed At one sage in the night she tended to one young child who wandered by. She motioned to him and the child asked to be held; she asked to be held as she had watched her parents and siblings fall dead beside her, ‘please hold me’. When morning came some survivors tried to get away but the militia shot them down. Again the militia rounded on the bodies; one took her by the hair and shook her looking for money in her pockets but she managed to remain lifeless convincing the assailant that she was dead. It was the arrival of the Rwandan Patriotic Front who changed the circumstances and who saved the day. There were advancing to capture a nearby hill. They could not offer much in terms of food or medicine but they offered a chance to live. The lady told us about what it is like to be a survivor of such a tragedy; so powerful was her testament that we didn’t get to hear it…the translator broke down in tears as she shared her story; he just let her continue as his eyes were filling over and over again. Some things were heard though. The fact is that as a survivor you feel you are constantly ‘cheating with life’; you act normal but you are far from normal. Healing doesn’t happen the pain is always there. It took ten years to even consider praying and thinking about God…God presence was notable by its absence. These people were let down. The wars of other countries were fought on their soil and at their expense. The country is doing well now. Economic activity is encouraged but you do not have to scrape very deeply to find that most people are still afraid. They are afraid of what they saw and witnessed during the genocide; they are afraid of it because it still incites fear in them. They are conditioned to be afraid; the heavy presence of military and police is more about security than peace keeping. They are particularly afraid because they know they are on their own. Those charged with a duty of care turned on them in a manner most foul and savage. The international community refused to be there for them when they were needed and those among the UN forces that did want to help were overruled by a bureaucrat placed under political duress at a desk in New York. The Church was silent before, during and after; it is a church that wants people to pray but not to reflect. It is a church that has lived in the shadow of others and has never been brave enough to stand in the light. The seven year old child who needed to be held is now a man and is presently studying in University. A Memorial Garden was put in palce soon after the genocide in the spot where the three thousand were murdered. Today we visited memorials. In Ireland memorials are comprised of well-polished granite stone with gold or back inlaid ornate writing. 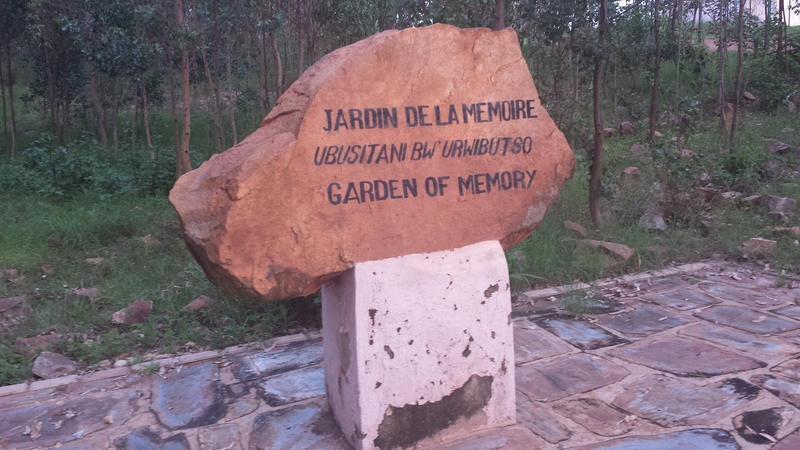 The area around memorials has carefully selected matching pebbles and ornamental shrubs making it a pleasant place to visit. In a sense memorials sanitise the memory. Not in Rwanda. As I sit and write I have a knot in my stomach; I am ever so slightly nauseous; all caused by what I saw. I still have the smell of death lingering in my membranes. These are the things that can’t be adequately captured in words and they only hint at the horrors of genocide. The memorials do not seek to obscure the horror of it all. This is the effect that today’s visits had on me; how awful must it be for Christine who travels with us. In these places we visited today she lost her family to this barbarity. I looked in as an outsider; she looked from within. 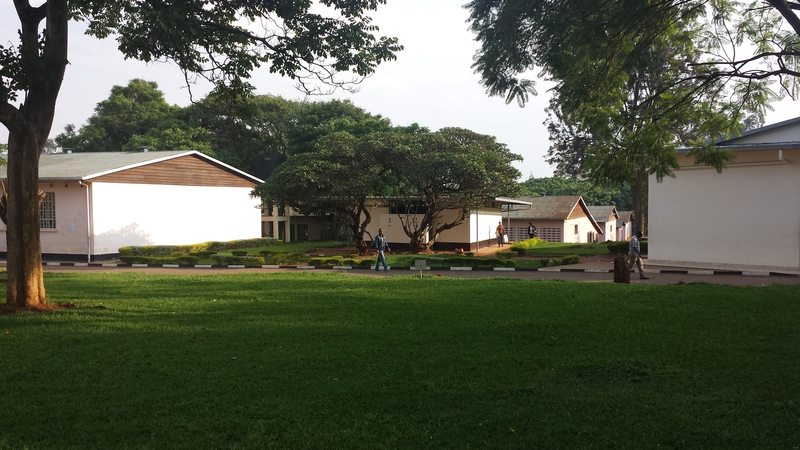 In the morning we visited the memorial in Nyamata. The memorial was once a church. The guide told us that up to six thousand people were killed here soon after the genocide began; over one thousand were shot in a twenty minute period. 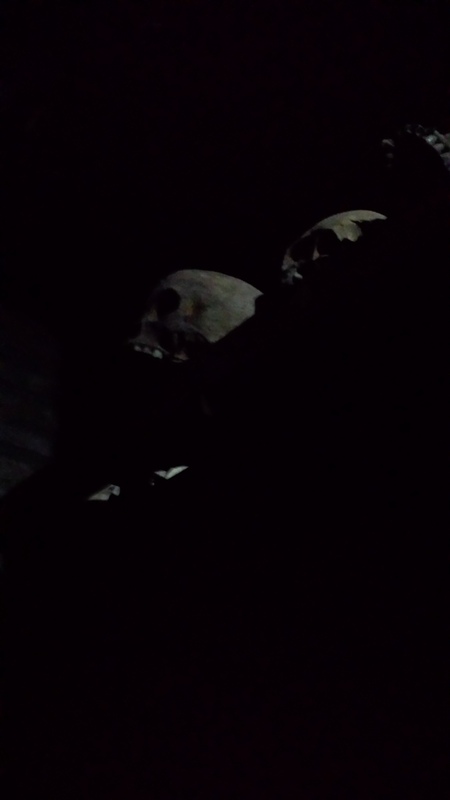 The memorial contains trays of human skulls and bones as you walk in the door. All around are clothes of victims draped over whatever they can be draped over; they are blood-stained; they carry memory, cruelty and death. The floor is pocked marked with holes made from grenades blasts; the building tattered with bullet holes. 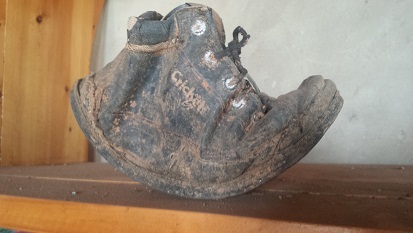 Some of the weapons used in the genocide on this site were left behind. The usual machetes and even one metal ball commonly called a shot-putt used in athletic events but it this case used to splinter a person’s skull. 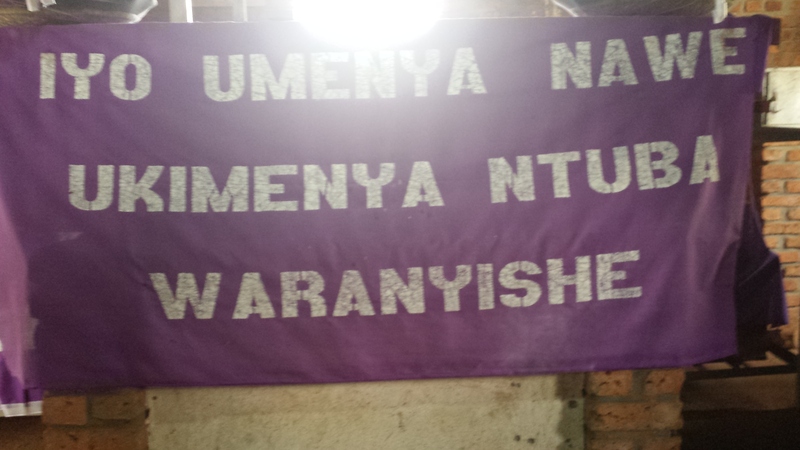 Draped over the altar is a purple cloth with the following inscription Iyo Umenya Nawe Ukimenya Ntuba Waranyishe. Obviously scribed by a survivor it is indeed a voice from the grave. ‘If you knew who I was and you knew who you are you would not have killed me’. There is play on tense in this powerful sentence. The person who speaks is gone…the person who committed the act is still alive. Other memorials carry slogans like ‘lest we forget’ or ‘Never Again’…this memorial brings out the fact that individual human being were killed by other human beings. In what used to be the sacristy there was a shelf containing books that children used when they took sanctuary and refuge in the church. One book lay open. 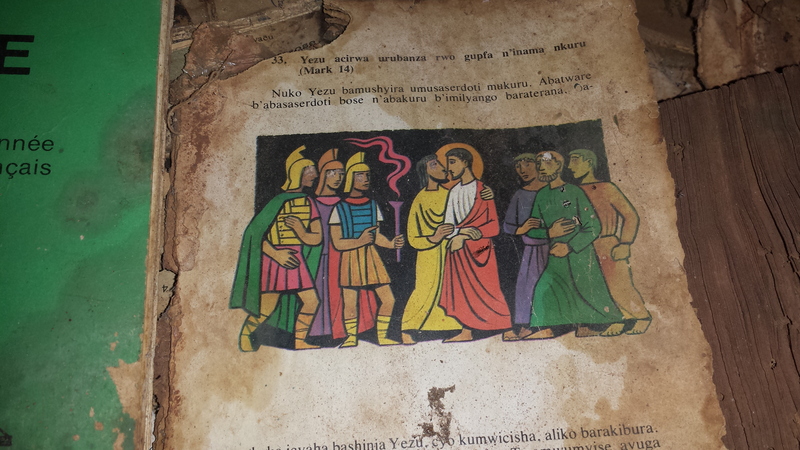 It depicted the betrayal of Jesus by Judas. As you see from the photograph, the pages are wearing thin but the colours in the picture remain strong. One may rightfully ask why were churches a place of genocide? The answer is quite simple. In the countryside when people are in fear they gather in one place. They thought they’d be safe in a Church but those planning the genocide were no respecters of place or of people. Later I asked Christine and John Bosco what was the prayer of the people in these places. Not surprisingly they had moved beyond the prayer of ‘God please save me’. Their prayer was ‘if I am to survive please let me’ but also ‘when I die take me into your loving arms Father’. They knew what was ahead; in one place only one thousand out of the ten thousand that were hidden in a swamp called the Valley of Death survived. The guides in these locations start talking in the third person and then quite soon you realise that they are survivors; one guide was ten when the genocide struck. He was left with no family. ‘Being a survivor is about gratitude’, he said ‘gratitude for the gift of life and living well physically, emotionally and spiritually’. I suppose when the taken for granted connections are ripped away from you, you have to work on the deeper ones. In the memorial at Nyamato we had mass. We sat together and prayed. From this highly articulate group -not slow to give a view or an opinion – there was only silence. What we were witnessing was beyond words; what we needed was beyond words; what Christine and John Bosco needed was beyond words. Some reading this blog may not be religious but for those who are, you may be aware of the power of the Eucharist to connect and to transport. 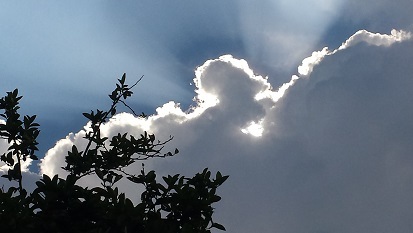 John Bosco was the only one who spoke; he said that it is now clear to him that the purpose of his return is to connect with his family who were taken from his; he spoke also for Christine who nodded. The mass was celebrated above a tomb that contained the remains of thirty five thousand people killed in the genocide among the remains in that place were those of her two sisters. Buried close by are the remains of an Italian nun, Sr.Tonia Locatelli. She was murdered in 1992, two years before the genocide. On national radio she said, ‘we must save these people, we must protect them. It is the government itself which is doing this’. Today Nelson Mandela was buried; I will never forget this day…laid to rest in his African soil.